Kesha sprinted through her local town, not even bothering to stop at Costa Coffe. Her thoughts were solely on getting as far away from where her parents were as possible. Suddenly, she collided into someone. Kesha staggered backwards, not looking up. "I-I&apos;m sorry," she stuttered weekly - her eyes fixed on the ground. "Kesha? What&apos;s wrong?" The person asked. Now Kesha&apos;s head snapped up, recognizing the voice. At the sight of Demi standing there, Kesha broke down. Tears streamed down her pale face as she looked up at her cousin. "Oh, baby girl..." Demi said softly. "It&apos;s okay." Demi wrapped her arms around her cousin, holding her close. Kesha clung to her like a Koala, desperate to feel safe for once. Demi began rocking her gently backwards and forwards in a steady rhythm. "It&apos;s okay," she whispered. "Shhh, it&apos;s going to be okay..."
"It&apos;s not, Demi. It&apos;s not," Kesha cried miserably. "I don&apos;t want to go!" "Go where," Demi asked in astonishment. "Baby, you don&apos;t have to go anywhere if you don&apos;t want to!" "I do, I do! They&apos;re taking me away - to lots of places," Kesha explained. "Who?" Demi insisted. "Kesha, please tell me." "M-my p-parents," Kesha replied softly. "You&apos;re leaving?" Demi asked, tears pricking her eyes. Kesha simply nodded. "But I only just-" She began, but stopped herself. Now wasn&apos;t the time, Kesha needed her. "Come on, lets go to my hotel room." Demi said instead, steering her towards where her hotel was. Once they were in Demi&apos;s room, Demi sat Kesha down on the bed. She went to put her arm around the vulnerable girl, but Kesha jolted away. "N-n-no! I-I don&apos;t need anyone!" Kesha yelled, digging her nails into her head and tugging at her hair. Demi was about to reply, when Kesha started screaming at the top of her lungs. "STOP IT! STOP, PLEASE! JUST STOP!" She screeched. It took Demi a few moments to realize that Kesha wasn&apos;t actually talking to her. "Sweetie, talk to me." Demi begged, reaching out again. "NO! Demi, please! Just don&apos;t touch me, okay? Please," Kesha cried and pulled away again. Demi let tears roll down her face as she watched Kesha, fear clutching her heart. It felt like it was being pulled right out. "No. No, no, no, no, no..." Demi whispered, massaging her scalp. "Not you, this cannot be happening to you!" "I swore-" Demi began, choking on her words now. "I swore this would never happen to you. Please, let me help you..."
"DON&apos;T YOU SEE? My God, Demi! You can&apos;t even see that you cannot help me!" Kesha screamed, finally looking up at Demi. "You want to know why? Because I&apos;m insane! I honestly...think I&apos;m insane." Her voice had dropped to a mere whisper now, barely auditable. "I&apos;m crazy...and there&apos;s nothing anybody can do about it. SO WHY CAN&apos;T YOU JUST LEAVE IT, DEMI?" Kesha said. Her voice started at a whisper but soon escalated, before finally falling again. "Just...let it go." 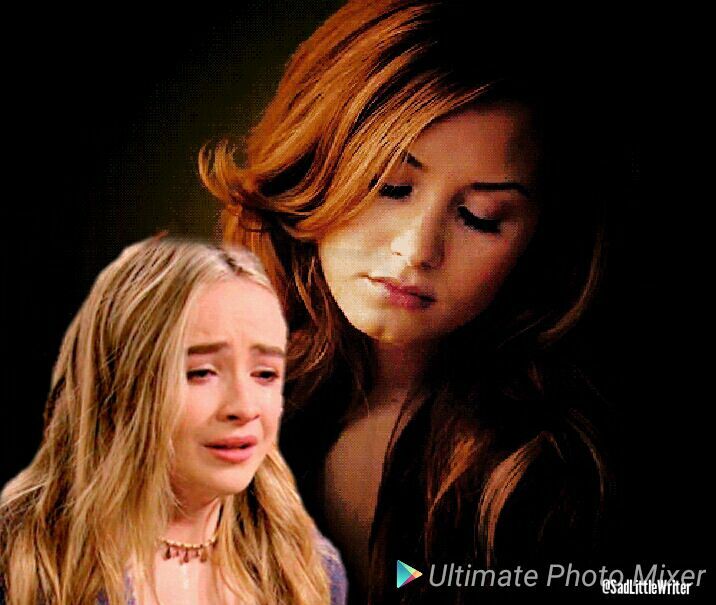 "I can&apos;t," Demi spluttered through her fast falling tears. "Kesha, honey, you are not insane. But we can fix this," she insisted. "I promise you we can!" Kesha gave a sad laugh, full of emptiness. "I&apos;m all out of band-aids, Demi..." She whispered softly, closing her eyes and leaning her head back in surrender. That was when Demi realized something scary. She didn&apos;t even know where to start! How could she possibly fix Kesha? She didn&apos;t even really know Kesha! She just watched Kesha silently, realizing that Kesha had slipped into a fitful sleep. Once Demi was sure that she was properly asleep, she climbed in next to the young girl. Slowly Demi stroked Kesha&apos;s hair, still silently crying. "Baby girl, I&apos;m so sorry..." She whispered, looking down at Kesha. "I promise you, I will fix your heart." Demi had never meant anything more in her life. She couldn&apos;t bare seeing Kesha like this. She kept thinking of the young three year old that looked up to her and admired her. That was always there. The girl that copied her. "Oh God!" Demi thought suddenly, gripping her heart. "Who copies me!" Demi sat bolt upright, panic flowing through her veins. She knew! She knew why it was her fault! Three year old Kessie ran into the kitchen of her aunt and uncles house. Her eyes scanned the room, desperately searching for someone. The kitchen was annoyingly empty, to Kessie ran out of the room and upstairs. The door to her oldest cousin, Dallas&apos;, room was open. Kessie stuck her head around the door, calling out to her cousin. "Hey, sugarpuff!" Dallas said, making Kessie giggle. "What&apos;s up?" "Dally, where Demi?" Kessie asked adorably. "In her room, I think." Dallas said, smiling. "She was a little unhappy earlier, about something at school maybe. Perhaps you could cheer her up!" Kessie agreed and skipped off to Demi&apos;s room, a huge smile filling her young face.